Clinically proven to moisturise for 24 hours. For dry skin. 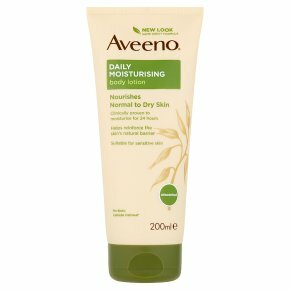 Suitable for sensitive skin.Aveeno® Daily Moisturising Lotion harnesses the concentrated goodness of finely-milled, naturally active Colloidal Oatmeal. Its fast-absorbing formula is clinically proven to moisturise for 24-hours and help restore the skin's natural barrier function to significantly improve the condition of dry skin in just 2 weeks. Skin is left feeling soft, smooth and looking healthy.